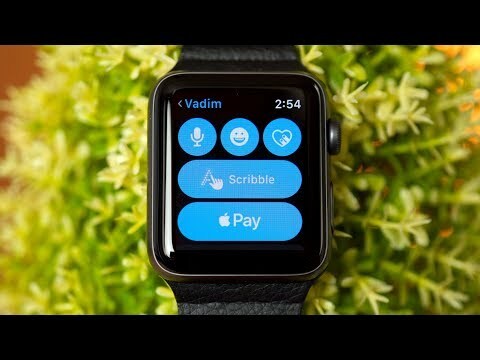 Upon installation of watchOS 4.2, users will see an Apple Pay Cash option within the Watch app's Wallet settings on a paired iOS device. Simply switch the option to the on position and sign in with your Apple ID. When the Apple Pay Cash prompt shows up, tap "Continue," and iOS will automatically start setting it up. Once it's complete, you will see your Apple Pay Cash card alongside any other cards connected to your Watch. Tap on the card to find more information and settings, including an option to verify your identity to make sure there are no issues sending cash through the service. Your Apple Pay Cash card should now show up in your Apple Watch's Wallet. From here, you can swipe up to view your card balance and double click to pay at any store that supports Apple Pay. At the bottom of a conversation in Messages, you'll see a new Apple Pay button. Tapping on it will allow you to adjust the payment amount. Tapping on the "Pay" buttong will trigger a prompt to double click the side button, which sends the payment. Processing should only take a few moments. If the payment says "Pending," it could mean that the other user hasn't set up Apple Pay Cash on their device. In such cases, tap on the Apple Pay Cash image in a Messages thread, hit view payment information, and cancel the payment. When it works correctly, you can tap on the Apple Pay Cash image to confirm that a payment is complete. On the receiving end, the user should see a message confirming that the payment was sent. They can then tap on the icon within Messages to view payment information. Friends might also request a payment from Messages, which can be authenticated and paid directly from Apple Watch. You can adjust the payment amount if you'd like, then double click to pay. Finally, if you head into Wallet app, you can check the balance of your Apple Pay Cash Card. The 5s doesn't support Apple Pay, but a Watch paired with it, does. The 5s apparently doesn't support Apple Pay Cash, but a Watch paired with, doesn't. Or at least that how it looks to me. Is there anybody who's installed APC on a Watch paired with a 5s, or has any definitive info or a link to same? I'd like something other than speculation or conjecture. When I reply to a received message on my Apple Watch I have the Pay option, but when I originate a new message to that same person I do not. Same problem here. 5S paired with a Apple Watch Series 2 with WatchOS 4.2. No Apple Pay Cash option on wallet app on phone. If I am sending money where is the choice on which account it will be paid out of? I set my Default Card to my debit card, but it drew my Pay order from my Apple Pay Cash card, so I think the Default Card setting may apply only to debit and credit cards when the balance in your Apple Pay Cash card is insufficient (mine was not insufficient) to cover your Pay order. In other words, all Pay orders are ultimately drawn from your Apple Pay Cash card?